telephone lines are currently unavailable. The Osborne eCold 220ES Undercounter Sliding Door Bottle Cooler offers a slightly shorter design that lets it easily slot in undercounter. Designed to cater for busy commercial bars, this bottle cooler offers the latest low-energy, maintenance-free specification and has a large 188 litre capacity, holding 200 bottles over the four shelves and base. 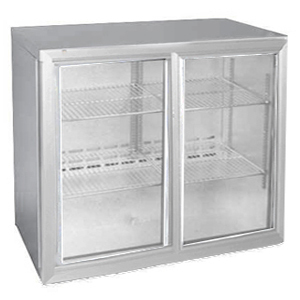 This cooler has double glazed sliding doors for easy access to contents and provides excellent insulation when shut. The body is manufactured from rust resistant zinc-coated steel with a hard wearing powder-coat in silver for a stylish finish. Please Note: This item allows curbside delivery only. Once the item is delivered, it is the responsibility of the customer to transport it further. For more information regarding this, please contact us on 01763 264 280. Please Note: Please allow 5 to 10 days for delivery. For Next Day and Scottish Highlands delivery please contact our trade sales department on 01763 264 280. There is no media for this product. © 2019 Drinkstuff & Barmans Ltd.